It is January. Time to take a look in the mirror and make some decisions. Do I or don't I try to drop a few pounds? It's a cycle. Don't we tend to do this every year? Start out fresh, craving healthy foods, wanting to maintain healthy eating habits...and sometimes we even get out of the house and take a walk or jump on the treadmill. Additionally, every year cabbage soup makes its regular appearance along with all of the regular promises. I do love cabbage and I eat my fair share, but, no, for me it doesn't appear only in January and only in soup! That being said, for this post it is cabbage soup but it is a kick up your heels kind of cabbage soup! It is a healthy soup. It is a smack your lips tasty soup! I am not bashing other cabbage soups. Being from the Central Valley of California, we have a large Basque population and there isn't anything better than their cabbage soup which is brothy and flavorful...and the best part, it is eaten with a scoop of pot beans and topped with some pretty spicy salsa. Now that is cabbage soup and one that I should post! So, I do like cabbage soup..and I like it year round, too. I am sharing this particular recipe because I am participating with a great group of ladies who have dubbed themselves the Soup Saturday Swappers. Forming the group was the brainchild of Wendy's at A Day in the Life on the Farm. The third Saturday of each month all participants will share a soup based on the selected theme! If you would like to participate, contact Wendy at the Soup Saturday Swappers link or at her blog. This month's theme is healthy soups. Here is my healthy soup choice for you! Heat oil in a large soup pot or le creuset (8 quart or larger) over medium heat. Add onions, carrot, celery, Anaheim and garlic. Cook, stirring frequently, until the vegetables have softened, 10-12 minutes. Add cabbage. Cook, stirring occasionally, until slightly softened, about 10 minutes more. Add the tomato paste, chipotle, cumin and coriander. Cook and stir for about 1 minute. Add the broth, 3 cups water, beans and salt. Cover the mixture and bring to a boil over high heat. Reduce heat and simmer, partially covered, until the vegetables are tender, about 10 minutes. Remove from heat and stir in cilantro and lime juice. Taste and adjust seasonings. Add the remaining cup of water if desired. Ladle the soup into bowls and top with queso fresco, yogurt and/or avocado. I am also participating in Full Plate Thursday hosted by Miz Helen's Country Cottage. I am always happy to have a lighter alternative, as long as it's full of flavor, and your concoction is a big winner! I love all of the ingredients in this soup! Anything with chiles in adobo too. I'm definitely giving this one a try. 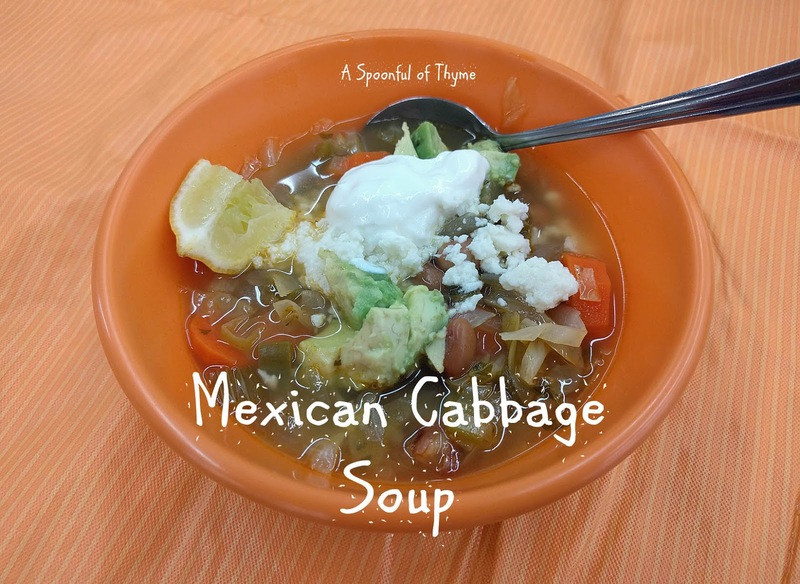 Mmmm, I love cabbage soup, and adding a Mexican twist makes me want to try this version. I love the Mexican flavors you added to this cabbage soup. YUM! I really love all things with cabbage. Definitely going to give this a try! 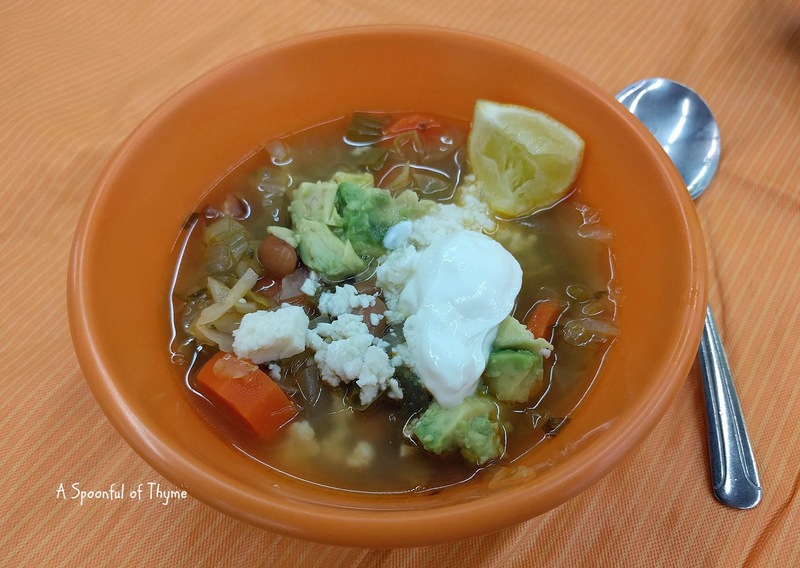 Delicious and healthy Cabbage Mexican soup. Love Cabbage Soup and this looks like one I should make, soon. Your soup is calling my name…it sounds so flavorful. Honestly everything about this soup sounds great - except the cabbage. I am just not a cooked cabbage girl. I wonder if spinach would work. Is there a traditional green for mexican recipes? All the other flavors sound great - probably a cabbage lovers dream! Maybe chard would be a substitute that would work for you. Excellent, doubled the chipotle peppers. Still added a little more to my bowl. Definitely not too spicy. What a fun group to be a part of and fabulous soups. Your Mexican Cabbage Soup is a soup that we will really enjoy! 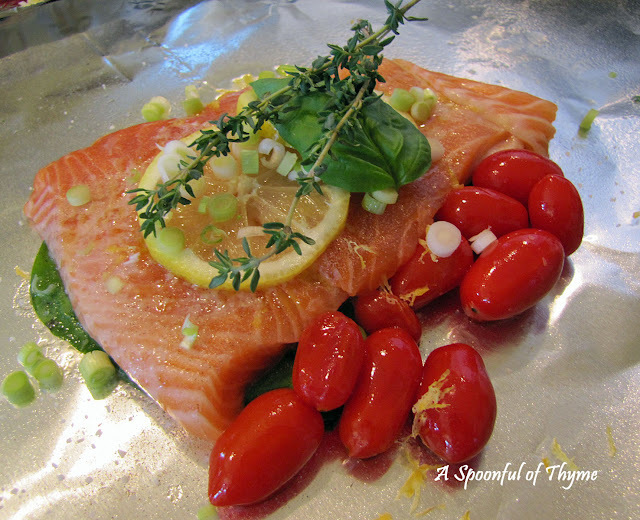 Hope you are enjoying your day and thanks so much for sharing your awesome post with us at Full Plate Thursday!